Bishop Challoner Justice and Peace Group Visit Parliament. 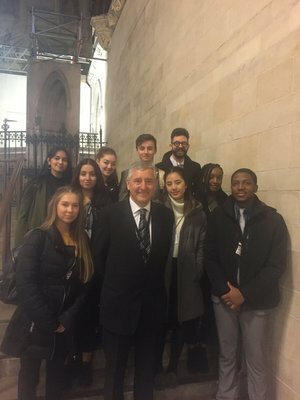 On Monday, 25th March the Bishop Challoner Justice and Peace group visited Parliament for a tour with local MP Jim Fitzpatrick. The group enjoyed a tour of the parliamentary estate and then had the chance to talk to Jim about their upcoming campaign focusing on homelessness in the local area. The Justice and Peace group is made up of 10 Sixth Form students and meets weekly to raise awareness of and campaign on issues relating to social justice and the common good. The group is part of the school’s Chaplaincy and is inspired by the principles of Catholic social teaching. We thank Jim and his office for making the trip possible and particularly for the advice and information our students received and were inspired by.